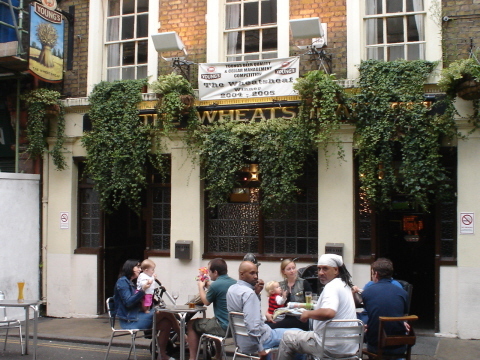 Owen Ogletree visited London in August of 2007 to cover the Great British Beer Festival. 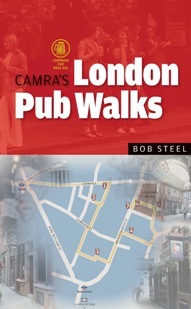 On the following days, he had time to experience six of the pub walks outlined in Bob Steel's valuable London Pub Walks book from CAMRA (Campaign for Real Ale). Photos and brief captions from the walks are found below. 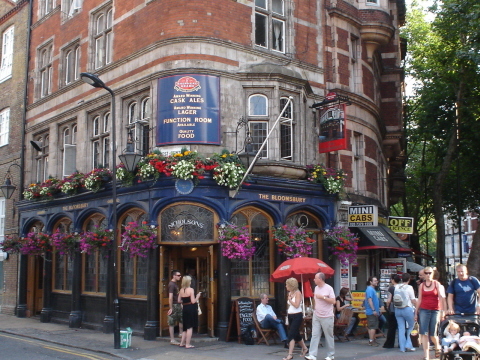 London Pub Walks is an extremely useful tool for persons looking for the best cask-conditioned, real ale pubs in the city. Because of its clear maps (with tube stops), easy walking directions and pub information sidebars, no beer aficionado should visit London without a copy. The book is highly recommended, and can be ordered from the online CAMRA shop by clicking the book image above. Closed on the Saturday that I stopped by, The Hope appeared to be an attractive neighborhood pub (from looking in from the front window). This pub offered Timothy Taylor Landlord (one of my favorite cask ales) and an interior with attractive mirrors. The music can get a bit loud at night. Nice little pub with the well-balanced Woodforde's Sun Dew golden ale on cask. 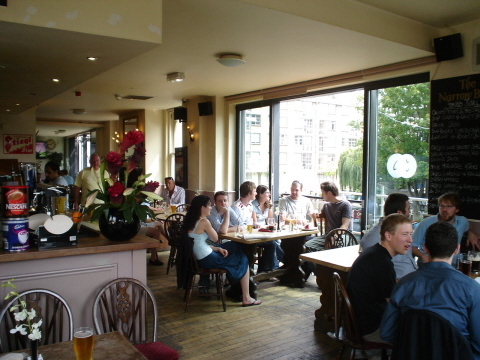 They also offer ale and sausage tastings every Monday evening. There is a beautiful ceiling in this Samuel Smith pub, along with Old Brewery Bitter on cask. All other beers from the brewery were in bottles or on keg. Samuel Smith should really offer a wider range of their beers on cask at their pubs. Shepherd Neame owns this cozy pub, but on the day I visited two of the casks were out. 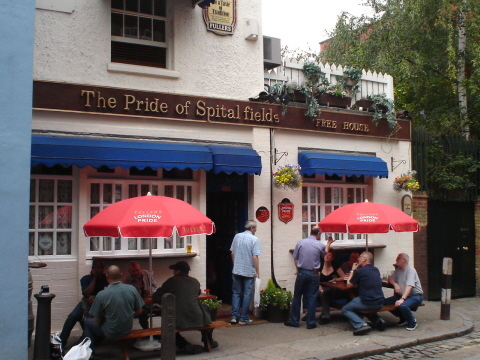 The British Museum is nearby, so this pub can be a bit touristy at times. 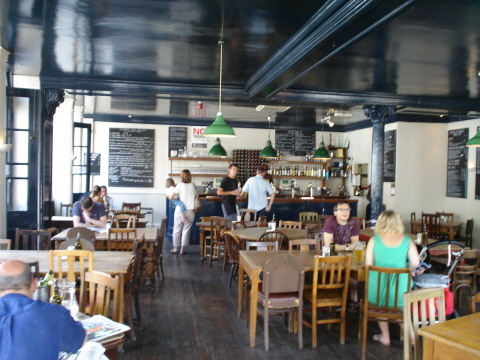 Recently refurbished Young's pub with the full range of Wells/Youngs ales. Nice pub food is available as well. This former Truman's Brewery pub is very near the Spitalfields Market and makes for a nice stop on a Sunday afternoon stroll. 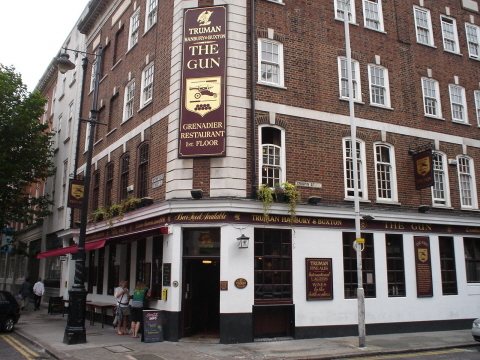 The old Truman's brewery (closed in 1989) is very nearby as well. 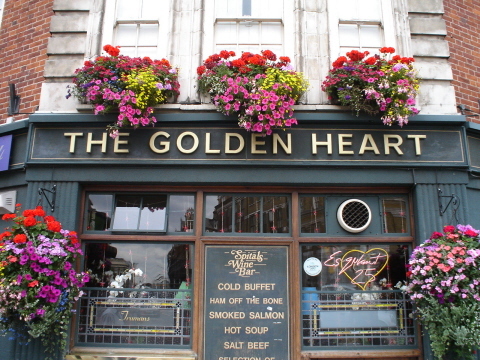 I have no photo from the nearby Ten Bells pub (they do not allow pictures of the interior tilework), so I made my way to The Golden Heart. Golden Heart had some interesting Truman memorabilia on display, and 2-3 interested real ales were on tap. 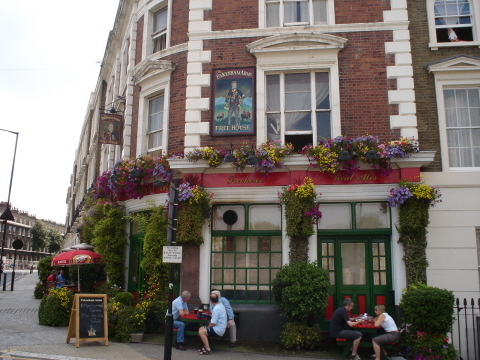 This locals pub is located in the heart of the curry district near Brick Lane. 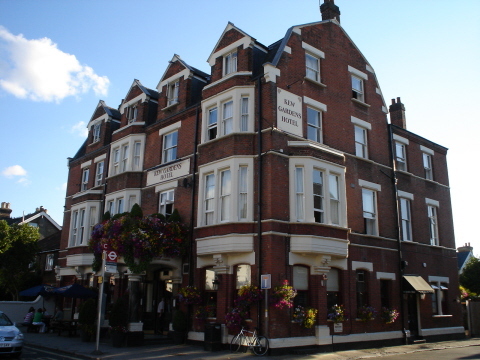 The full range of Fullers ales can be found here in close to perfect condition, so it is no wonder that this pub is popular with fans of great real ale. 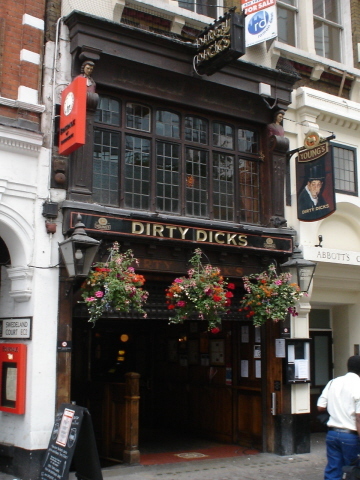 I was not very pleased with my visit to this pub. The real ales from the Nethergate brewery were all served far too warm and had notes of sourness and infection. The owner told me that the tap water in the area was also undrinkable (due to road construction out front perhaps). An Indian buffet bar was being installed on one side of the pub. I hope things improve soon. 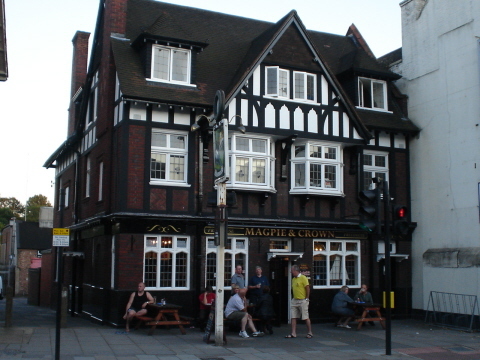 Very quiet pub (during the day) with a cozy interior and nice tilework around the fireplace. Three real ales were offered including Adnams, Spitfire and Bass. Interesting pub with respectable pub grub and unique plant artwork on the interior mirrors. This plant artwork comes from the fact that no real plants would grow inside (according to the owner). Interesting interior color schemes and decent real ales can be found here. 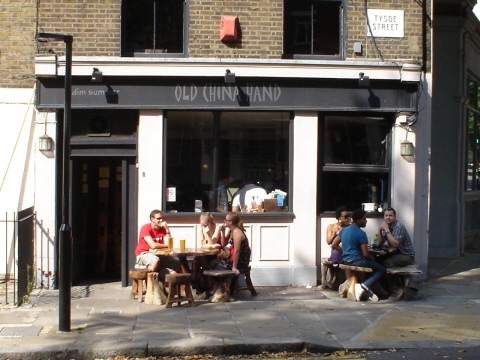 A completely organic pub (food and beers) with cask ales from Pitfield Brewery (E.K. Goldings, S.B. and Eco-Warrior) that were all in wonderful condition. There is one main, square, central room with a side dining room. Look to the chalkboard for daily food specials. Very pleasant pub with four real ales on tap and a relaxing view of the canal. 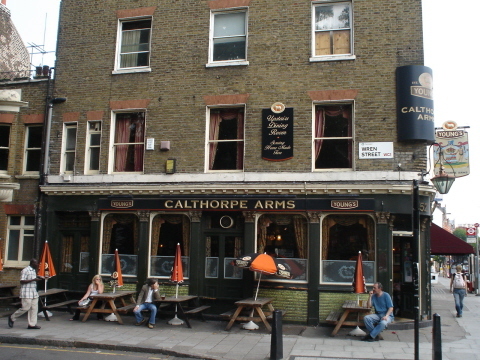 This pub is very popular with CAMRA members and offers one of the best real ale selections in London. There is always a Mild Ale on tap, and blues and jazz are presented on the weekends. 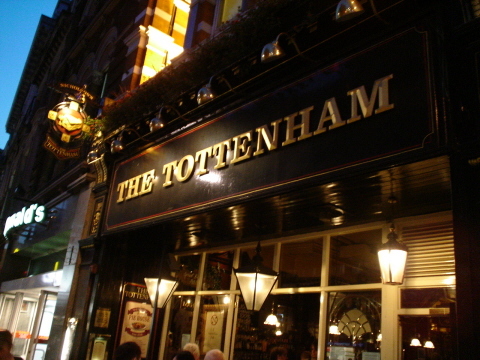 A must-see pub in the city. This is a pleasant pub offering the range of fine beers from Wells/Youngs. Stop in to have a pint and watch a football game with the locals. A spartan pub with good Chinese food and Black Sheep real ales. The real ales were served a bit warm in August when I visited. Cellar temperature should be closer to 55 degrees F -- not 70 degrees. 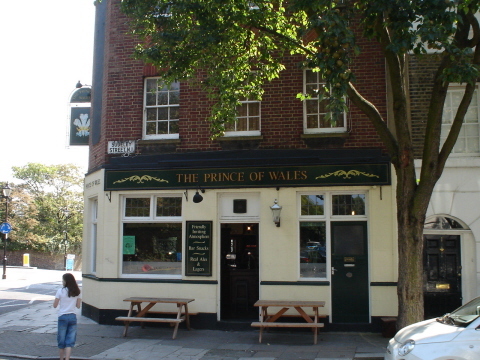 Across the street from London's largest post office, this locals' pub opens at 9 AM every day to accommodate the postal workers. Good range of real ales from larger breweries is served up, and the Sharp's Doom Bar bitter was very clean and malty. 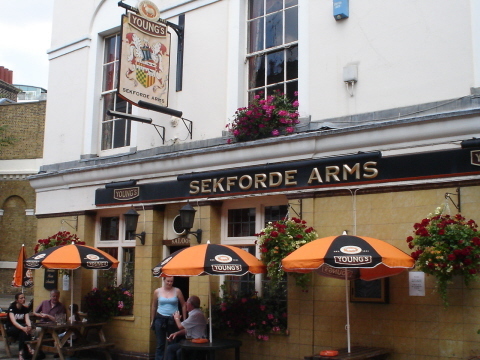 This is another Young's pub that has won awards from CAMRA over the years. The real ales were excellent and all served at the proper cellar temperature. Food is available, and the upstairs dining room is open most days for lunch. 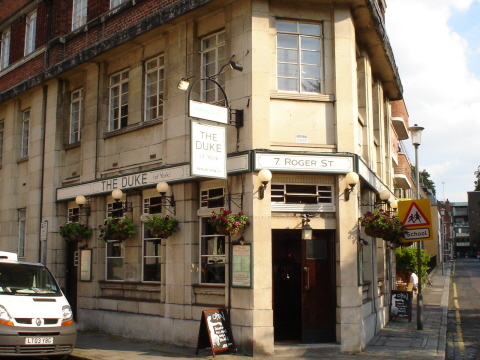 This pub features some impressive 1930s, Art Deco architecture. When I visited, the real ale from Adnams had an unpleasant, spoiled aroma. Worth a revisit. 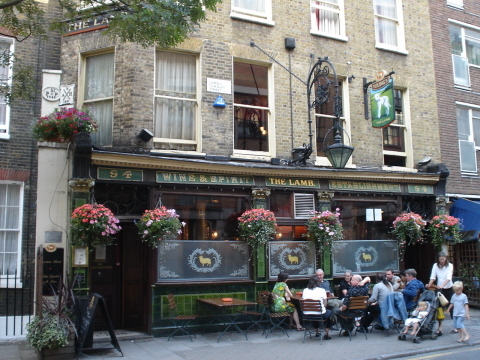 The Lamb is one of my favorite London pubs. Check out the ornate glass "snob screens" at the bar that would allow you to place your beer order without being seen by others in the back of the pub. 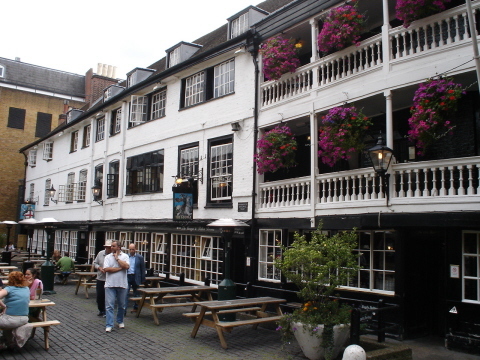 Dripping with history, The George has multiple rooms and 3-4 real ales. 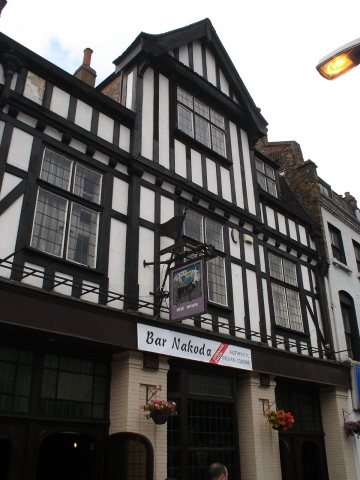 Only a small portion of the original pub remains, but it is still quite impressive. 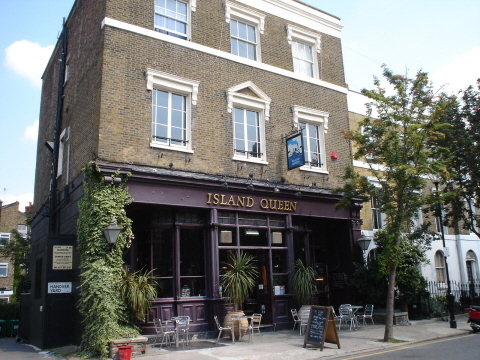 This excellent establishment was voted CAMRA's London Pub of the Year back in 2003. 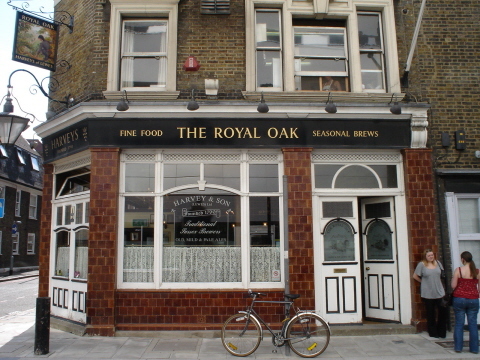 They offer all of Harvey's regular and seasonal real ales. Cask-loving locals are always in attendance. 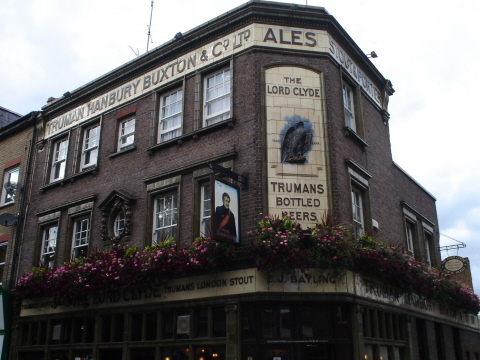 Another former Truman house, The Lord Clyde has a very distinctive, tiled front and great ales from Fuller's, Adnams and Shepherd Neame. 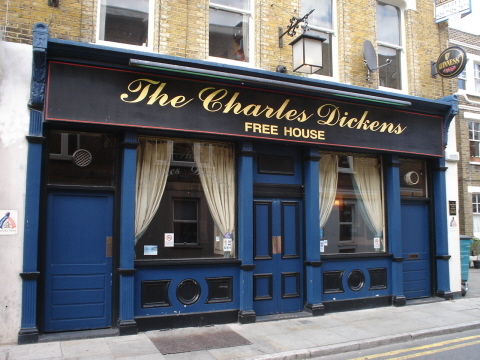 Located in a very quiet area of town, the Charles Dickens was closed on the Sunday that I was there. 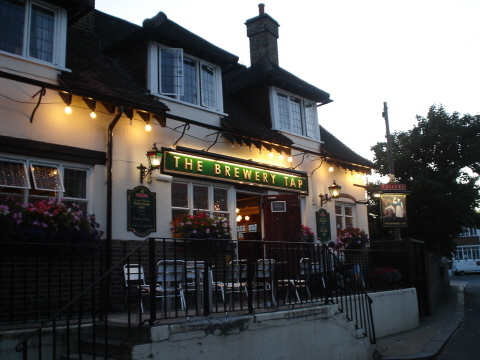 The guidebook boasts that six well kept ales (many from smaller breweries) can be found here. Wow! 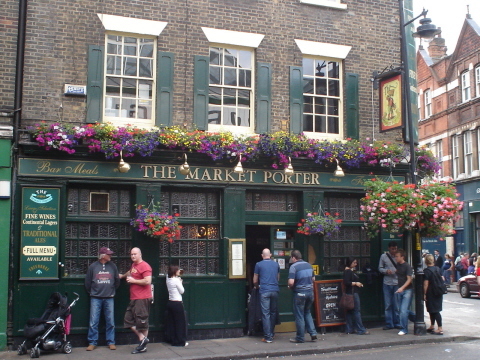 Market Porter offers one of the best real ale selections in London -- a dozen taps that include many rare ales from microbreweries can be found here. The staff is quick to offer small samples too. Small pub near Market Porter with a tiny beer garden out back. Very basic decor inside with standard cask-ales. 128 High Street, Brentford, Middx. The folks at Magpie & Crown really promote microbrewed real ales from the region. 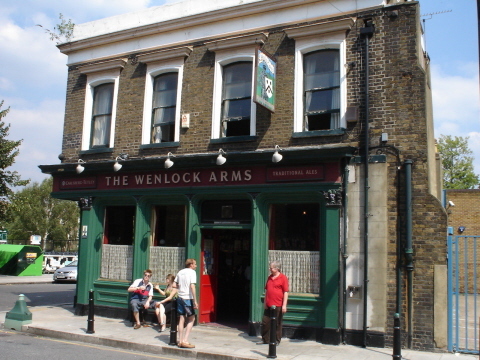 Almost 2,000 cask-conditioned ales have been served here in the past 10 years, and the pub is a regular hangout for local CAMRA members. 47 Catherine Wheel Road, Brentford, Middx. This is a delightful, small Fuller's house for locals. 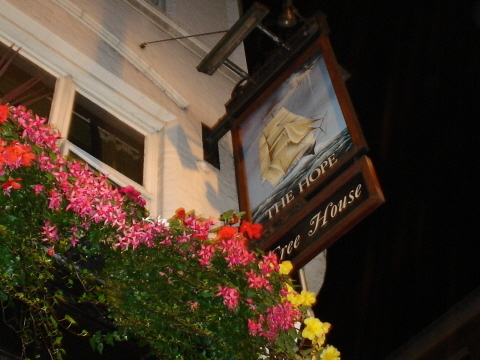 It is located on the very quiet Catherine Wheel Road that branches off High Street. The Fuller's ales are superb -- along with live music from local musicians in the evening. 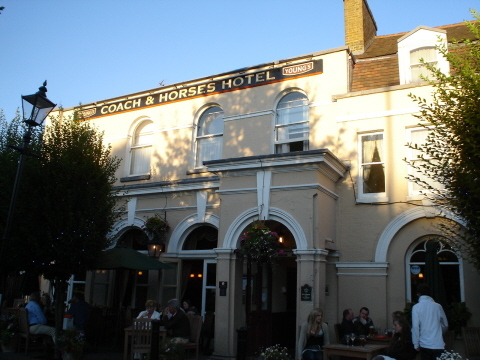 An upscale Young's hotel and pub just a short walk from the Kew Garden tube stop. The ales were all well maintained. This gastropub offers a great selection of tapas, cheeses and upscale pub fare. 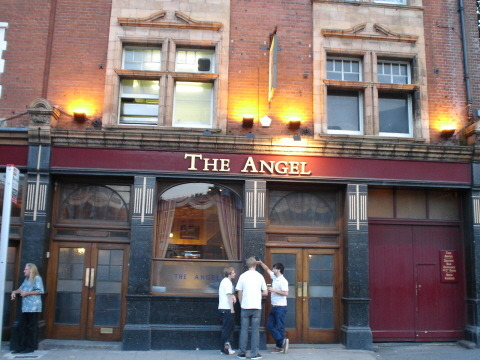 Six cask ales are usually on at this very clean and attractive establishment. 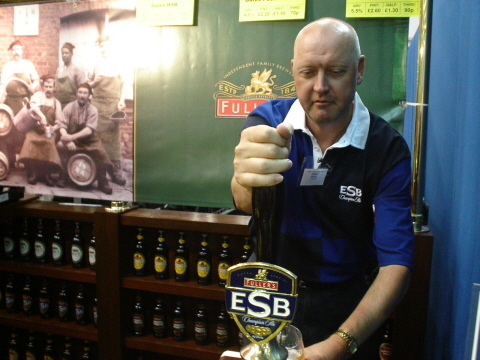 My trip in August of 2007 coincided with the Great British Beer Festival in London. The GBBF was one of the most unique and interesting beer events I have even attended -- more than 280 breweries from across the UK showcased almost 700 outstanding real ales -- that's 340,000 pints of beer under one roof. Attendance came close to 70,000 and was up almost 40% from two years ago -- highlighting the fact that flavorful, personable, traditional ales are making great gains in Britain. 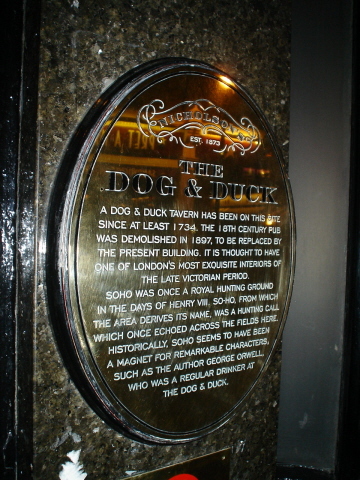 Walks 10, 19, 23 (and 18) are within close proximity of each other (centered around the Russell Square and Farringdon tube stops). I did walks 10, 19 and 23 in one day (drinking a half pint and glass of water in 20 minutes at each pub). Walk 27 (Kew) covers a great deal of ground and takes the bulk of an afternoon and evening. Note that the majority of pubs from the book's walk 18 are closed on Saturday and Sunday. The Princess Louise (walk 10) was boarded up for remodeling (I hope this beautiful old pub will reopen soon). A pub or two from each walk may be missing from the above report. Buy the book for complete details! Click here to learn more about cask-conditioned ale (real ale).